In the hustle and bustle of holiday shopping and sales, it’s easy to get a little lax with our personal security. Besides; who’d ever try to steal from us during such a wonderful time of giving? But unfortunately, this is the time of year where criminals are at their peak. According to the Arizona Division of Public Safety report, November has the highest rate of "pick pocketing" of any month of the year, while shoplifting crimes are highest in December. That being said, here are some essential holiday safety shopping hacks. Keep all car doors locked and windows closed while in or out of your car, even if you’ll only be away for a minute. A quick thief needs a mere sixty seconds to make off with your car. Always protect your PIN by shielding the ATM keypad or pin pad inside the store from anyone who is standing near you. All it takes is a peak, a quick distraction, and sleight of hand before your wallet is gone and your bank account has been drained. Don’t be a target for dishonest criminals this holiday season, and don’t be afraid of being paranoid. 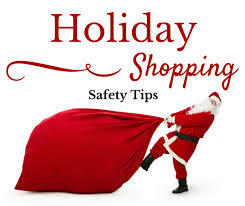 You can never be too safe while you’re shopping for the season, and you can’t afford to be careless. Please share these tips with your loved ones and shop safe this holiday season.